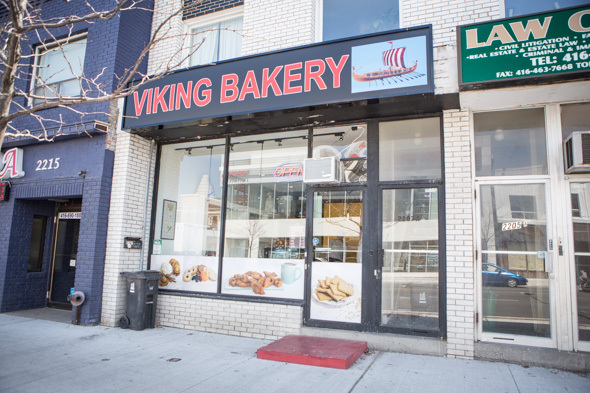 Viking Bakery might be Toronto's first bake shop devoted entirely to Icelandic treats. 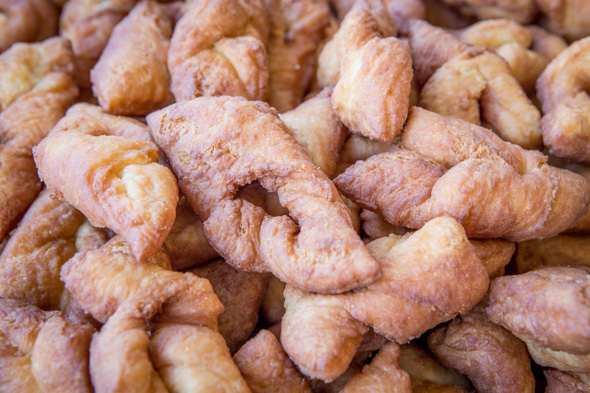 Though many Torontonians might not be familiar with delicacies like vinarterta and kransa kaka , that hasn't stopped the humble little bakery from becoming a popular stop for East Danforth locals in need of a sugar fix. 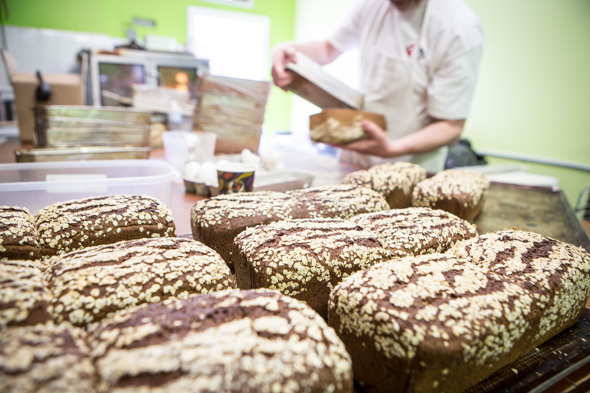 Owner Birgir Robertsson arrived in Canada five years ago, settling in Gimli, Manitoba (which, if you didn't know, is home to the largest Icelandic population outside of Iceland) and opening up his own bakery, where he refined his recipes over several busy summer tourist seasons. Instead, he set up shop in a former wedding cake shop near Danforth and Woodbine. 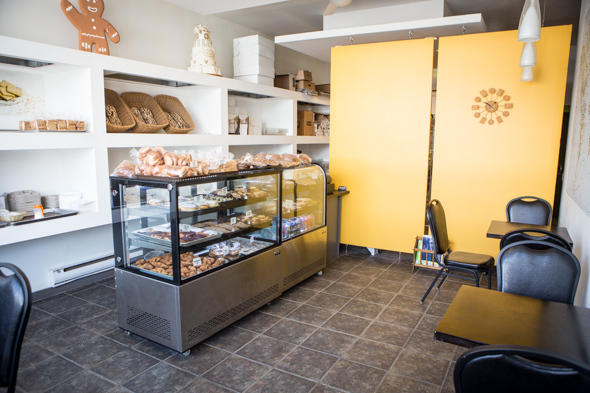 The previous owner's fake cakes still decorate some of the shop's high shelves - but you won't find any three-tier showstoppers here, just a small bakery case piled high with doughy, snack-sized creations. 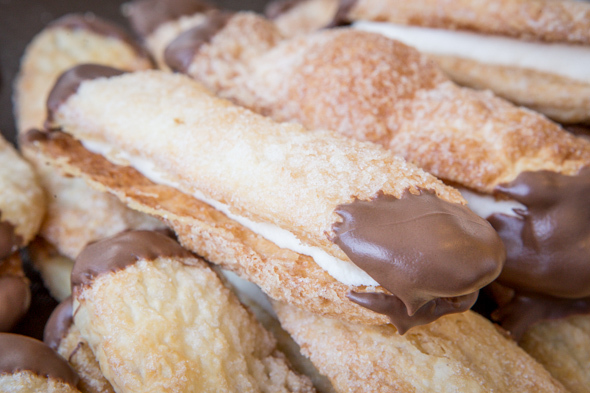 The sweets here tend toward sugariness, with buttercream fillings and chocolate dips adorning biscuits and buns that vary widely in texture, from the marzipan-like, horn-shaped kransa kaka ($1.99) to flaky "Viking wafflers" ($1.99) to chewy oatmeal cookie sandwiches that taste faintly (and deliciously) of cereal. 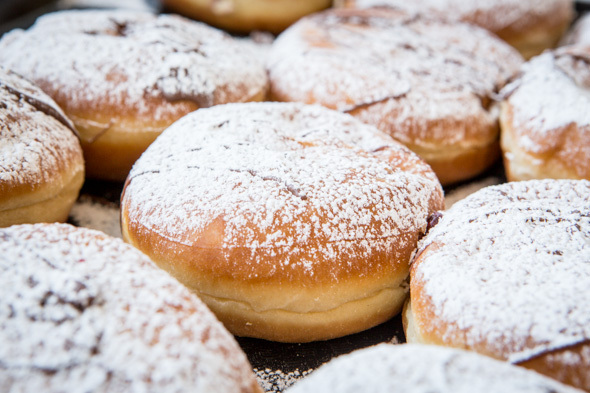 The shop's most popular offering is the kleinur ($1.39), a deep-fried, unadorned cake donut formed into a twist. (Think an old fashioned plain, but with a little hit of lemon.) It's one of the menu staples, along with Icelandic cinnamon buns and raspberry-layered vinataerta; others rotate depending on the day. 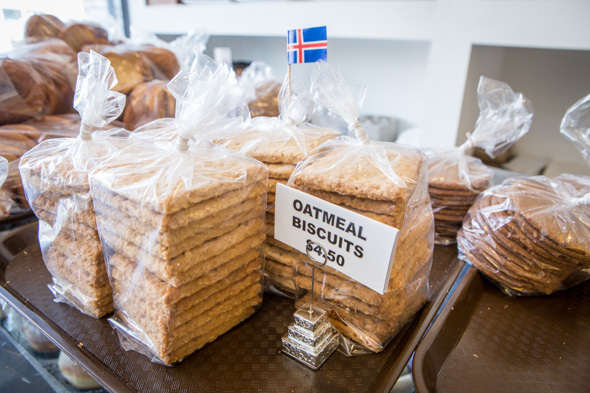 Little bags of gluten-free coconut macaroons or oatmeal biscuits (sort of like English digestives; Robertsson suggest eating them with cheese) are available to go. You'll also find savoury creations, including caraway rye loaves or tuna salad sandwiches ($3.49) on dark bread buns. "Saturday or Sundays are the most busy days, so I try to have more on those days," he says - but he doesn't mind the rush. "It's a very nice community - very nice and friendly people." Clearly, setting sail for a new homeland was the right choice.